In Chinese culture, especially under the influence of Taoism the turtoise is the symbol of heaven and earth, its shell compared to the vaulted heaven and the underside to the flat disc of the earth. The tortoise was the hero of many ancient legends. It helped the First Chinese Emperor to tame the Yellow River, so Shang-di rewarded the animal with a lifespan of Ten Thousand Years. Thus the turtoise became a symbol for Long Life. It also stands for immutability and steadfastness. We often see stone grave steles on a stone tortoise or reliquiaries standing on it. The tortoise is also regarded as an immortal creature. As there are no male tortoise - as the ancient believed - the female had to mate with a snake. 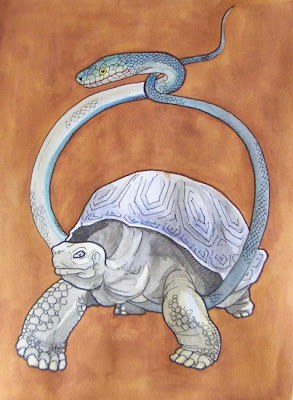 Thus the turtoise embracing a snake became the protector symbol of the north, but since the word "tortoise" was taboo in Chinese, it was referred to as the "dark warrior" (genbu 玄武 ) and finally became one of the protector gods of the four areas, Zhenwu in Chinese Taoism. P.s. subrufa nest once per year. A nest is dug to a depth of approximately 15 cm and the eggs deposited. Eggs are white/grayish and covered with a clear slime. They measure 28-31 mm x 15-18 mm and approximately 4-6 grams. Fertile eggs develop a white spot or area on top and hatching occurs in 65-68 days. a case for fire ants..
"What you have told us is rubbish. The world is really a flat plate supported on the back of a giant tortoise." The scientist gave a superior smile before replying, "What is the tortoise standing on?" "You're very clever, young man, very clever," said the old lady. "But it's turtles all the way down!" the Indian said, "Suppose we change the subject." ... the story is patently wise, teaching us that we will never get to the bottom of things.
. Urashima Taro 浦島太郎 . To protect his eyes against the sand and the dry climate, it produces tears and the eyes are often wet. With the wish for a long life of 1000 years, like the mythical turtle. Issa's diary says this hokku was written on the same day on which Issa went to the monthly haikai meeting led by a leading Edo poet, Suzuki Michihiko (1757-1819), which was held on the 6th of every month. It was a gathering Issa often joined. This particular meeting was on the 6th of the 7th month (July 31, 1805), and Issa wrote the hokku there or soon after. Issa linked verses a few times with Michihiko, but I couldn't find any information about whether renku were written at this meeting in addition to hokku. The hokku is about the night of 7/7, the Tanabata star festival. Many people are looking up at the sky, waiting for the Milky Way to rise, since according to a legend that goes back to China, the weaving woman star (Vega) and the oxherd star (Altair) love each other madly but are able to meet only one night a year -- on 7/7, and only if there are no clouds in the sky. If the sky is clear, the weaving woman crosses the Milky Way on a bridge formed by magpies and meets her lover. Many decorations are set up, including ikebana and tall cut bamboo trees with poems and decorations hanging from their limbs. In Issa's time most people stayed up late to eat, drink, and watch the stars, and many stayed up the whole night, as they did on the night of the harvest moon. In Issa's vision a group of people stand watching the sky with their back to him, and their total absorption in the Milky Way makes them -- and Issa watching them -- feel cool, as if they were momentarily fused with the cool sky, even though the night must be quite hot. It's the feeling of coolness that counts, not the objective temperature. The coolness is so strong at that moment that even a turtle, who seems to be looking up at the same part of the night horizon as the humans, looks cool. Turtles don't wear thin robes the way humans do in summer, yet something about the turtle's stance suggests that it, too, influenced by the night sky, feels cool. This synesthetic hokku seems to be about the power of feelings and the sense of sight to overlap with and influence tactile sensations as well as about the relation of humans and other animals to the cosmos. That it is backsides which strike Issa as being so cool suggests that the absence of individual faces may increase the sensation of non-duality with the universe. Often masks in No drama have a similar effect.
. WKD : Star Festival (Tanabata 七夕). 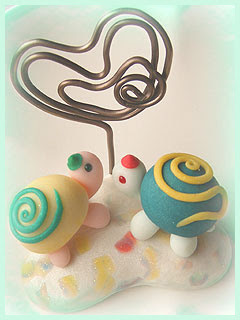 source : Happy Haiku Forum .
. box turtles (Terrapene) . If the fishermen take good care of the sea turtles, they will have a good fishing harvest. Toward the end of the Meiji period, around 1912, some workers on a maschine boat on the Tonegawa caught a 海がめ sea turtle and ate it. That day when they finished work and wanted to go back to the harbour, the sea suddenly turned wild and the boat capsized. Only one of the workers made it back to the shore alive. Others found him mumbeling "this turtle, this huge sea turtle . . . " and then he breathed his last too. The fishermen of Choshi say this was the curse of the sea turtle and have great respect for this animal.
. Legends from river Tonegawa 利根川 . 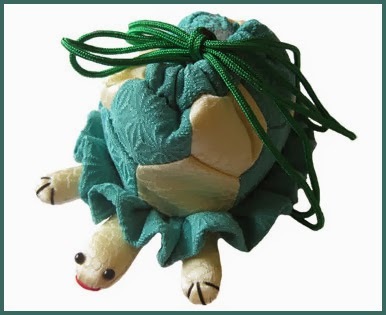 Kenmun is a kind of sea turtle Yokai, friend of Kappa san. 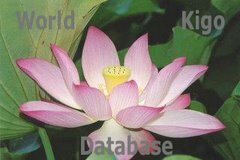 Kenmun live near アコウの木 / ガジュマルの木 the banyan trees . They like Sumo wrestling and often come to lure farmers at the beach, who are making salt. Kenmun also does Sumo wrestling with Yamanokami. 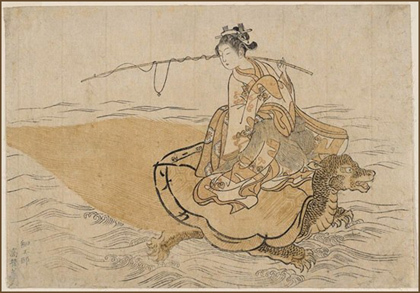 The Kenmun is related to legends about Yamanokami. A man was walking in the evening when suddenly a kind of fireball came rolling down, with stones and all. He fled to his home as fast as he could. There he hung up some amulets, but the flames kept lurking around his house all night. Next day he killed a pig and hung the legs up. This helped him not to loose his own light.
. Yama no Kami 山の神 God of the Mountain . Once a woman was about to give birth. 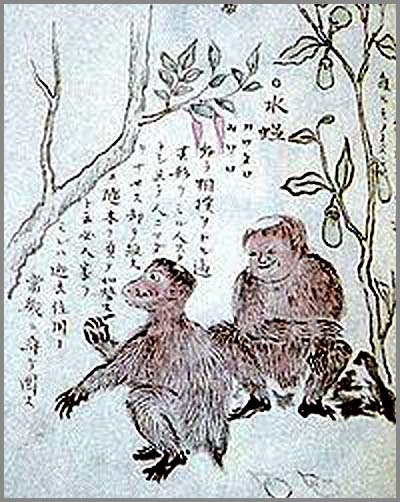 Her husband went to ガジュマルの木 a Gajumaru tree where he saw a Kenmun with two children. They let him know that his child would die when it was 19 years old. 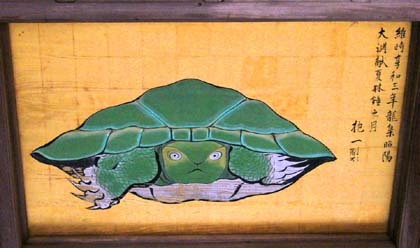 Tortoise is a symbol of longevity. It is said that if you rub its head, you can live a long life! This statue is called Juzohi-no-Okame (寿蔵碑の大亀), or ‘Longevity Monument of the Giant Tortoise’. The giant tortoise stands 5 meters and 10cm tall. Once a man named 蔡譲 was on his way to China, when a typhoon came and he fell over board. Suddenly one 亀 turtle and two 鱣 sea snakes came and helped him. It became custom in his family never to eat the meat of a turtle or pike conger eel after that. Kameido choo 亀戸町 Kemeido, Kame-Ido "Turtle Well"
Kōtō 江東区 Kōtō-ku, Koto, "East of River"